Pest description and crop damage Also known as speckled cutworm moth, the adult is about 1 inch long and has a distinctive color pattern of scales on the wing that range from light brown to black The appearance of the larva varies with age: young larvae resemble green fruitworms (green with a lateral stripe), while older larvae may be bright green to tan to a light red or brick color. Mature larvae have a herringbone pattern on the dorsal side and may be up to 2 inches long. Larvae can defoliate shoots. 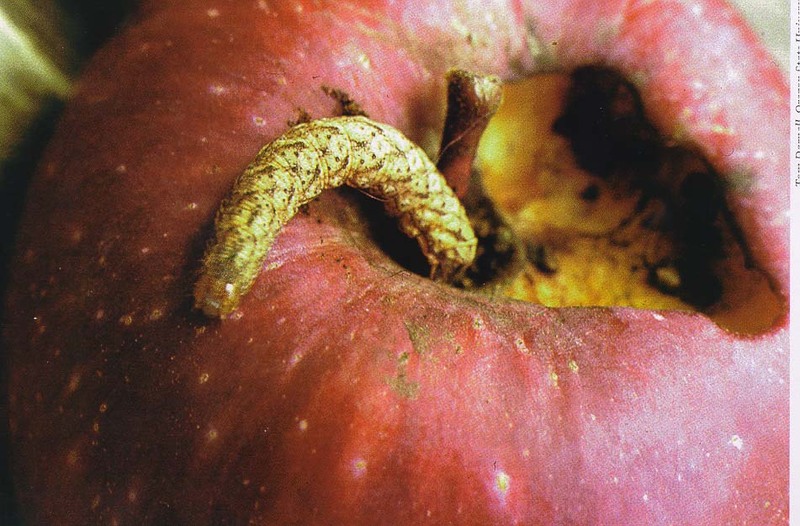 Older larvae also feed on the fruit. Biology and life history The insect overwinters as a pupa in the soil and adults emerge in May and June. Eggs may be deposited in fruit trees or on weed hosts. The first generation larvae appear in June and July and feed principally on foliage, but may also feed on fruit. Larvae are voracious feeders and can defoliate shoots in a few days. The emergence of second generation adults begins in late July and they are active through October. Larval feeding from the second generation begins in mid-August and larvae can be found in October. Scouting and thresholds Examine fruit clusters shortly after fruit set for the small green larvae. They tend to occur in clumps, so thorough monitoring is required. Home orchardists: Adults can be collected in black-light traps. Hand-pick larvae when thinning fruit. spinosad (Entrust 80WP) at 2 to 3 oz /a in up to 100 gal water per application. Do not exceed 9 oz /a per season. REI 4 hr. PHI 7 days. [Group 5] larvicidal] OMRI-listed for organic use.